The primary nursery furnishing is a crib and the Venetian 4 in 1 Fixed Side Convertible Crib by Storkcraft is an ideal preference. This amazing crib is designed with bold and beautiful curves on all four posts and across the bottom along with pretty moldings at the top. The style and matte Black finish (non-toxic) make the crib a stunning focal point for the nursery decor. It has special appeal with beauty, versatility and safety. 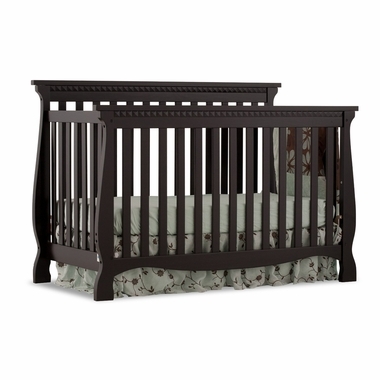 This lovely solid wood and wood product furnishing has every adjustment to keep your child safely tucked in the crib. The rails are stationary all around and will not come loose with jiggling of energetic little hands. As your child grows and stands in the crib, the mattress will lower to prevent pulling out or toppling over the rail. But the time will come for your baby to sleep in a toddler bed and that is an easy transition by putting a toddler rail at the front. A little kid getting bigger doesn't need a toddler rail and without the rail it then becomes a daybed until your child gets even bigger and needs a full-size bed. The gorgeous front and back rails can be used as headboard and footboard on a full size bed frame. (full-size bed rails not included). From infancy to adult age, this crib is the perfect bed for your child's bedroom.